Tshwane International Show - One of the biggest events in South Africa! What better way to celebrate springtime this year than with fun, fun, fun? 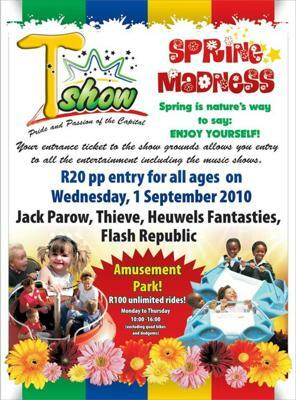 Enjoy great shopping bargains, wonderful entertainment, a special youth zone and an excellent agricultural programme, the Tshwane Show is the place this spring. Themed Pride & Passion of the Capital, the T show is filled with all that. Pride because the Show is established as one of the leading events in Tshwane, and Passion because the Show is passionate about South Africa, our City and our people, and our exhibitors and participants are passionate about their businesses and products.